Bring a comfortable seat with you to the campsite with the Coleman Broadband Mesh Quad Camping Chair. 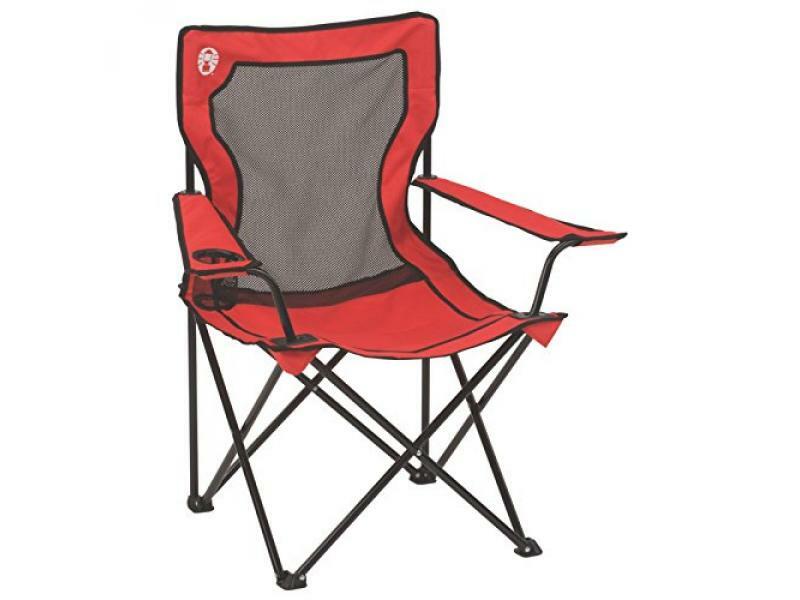 Bring a comfortable seat with you to the campsite with the Coleman Broadband Mesh Quad Camping Chair. Ideal for camping, picnics, or backyard barbeques, this versatile folding chair offers premium comfort in a roomy yet portable design. It features a breathable mesh back that allows the breeze to cool your back on hot days, plus an integrated mesh cup holder that keeps a refreshing beverage within your reach. Designed to ensure your comfort, the chair features an extra-wide 21.3-inch seat that offers plenty of room to lounge and adjustable arms that let you customize the chair to suit your preferences. The strong steel frame can support up to 250 pounds and withstands seasons of heavy use. And thanks to its collapsible design and convenient carrying bag, this folding chair is easy to store and transport.